Summary When Hiccup and Toothless discover an ice cave that is home to hundreds of new wild dragon, the two friends find themselves at the centre of a battle to protect the peace. 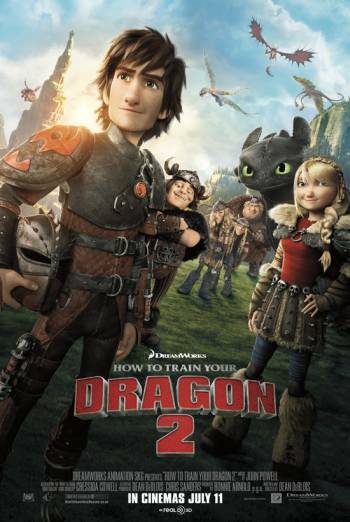 HOW TO TRAIN YOUR DRAGON 2 is an animated adventure sequel, in which Viking villagers and their pet dragons face threat from an evil dragon trapper. The Vikings carry weapons such as swords, spears and arrows, which are used in battle sequences, but without any sight of blood or injury. The dragons breathe fire and ice at their enemies, but again there is no sight of human injury. Frequent scenes of mild threat show characters in danger, and all but one survive. A villainous horned dragon controls the other dragons' minds, in one case turning the hero's own dragon against him. However, there is never any real doubt that good will win out. The film also contains very mild innuendo and infrequent very mild bad language ("Oh my God"). A character called 'Blood-fist' is mistakenly referred to as 'Bloody fist'. A character's death and funeral is treated discreetly and respectfully.